My posts are about to take on a strong bias towards field work and interviews with the researchers kind enough to offer assistance to our lab as we embark on a Northern Hemisphere tour. Not only will we be sampling seaweeds along both North American coasts, we’ll be jet-setting to Europe and to Japan. As my thoughts have bent increasingly toward Japan with our departure date looming and thinking about invasions, it seemed appropriate for a last paper review about an invasion. But, this invasion occurred in the opposite direction of the one we’re investigating. So et al. (2015) examined Daphnia pulex in Japan to determine whether the populations were indigenous or recent colonizer. 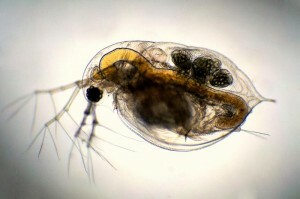 Using mitochondrial DNA, they were able to determine that the Japanese populations were colonizers that had hybridized with another Daphnia species prior to arrival across the Pacific. There were 4 distinct groups, based on mtDNA, but only one unique multilocus microsatellite genotype was found per group, suggesting asexual reproduction. Interestingly, some clones could not be attributed to recent anthropogenic activities, but might have instead been the result of extremely rare events, such as the disruption of migratory flyways due to a volcanic eruption. But, if populations are asexual, are they dead-ends? Do they require the influx of new migrants to increase genetic diversity? This entry was posted in population genetics and tagged Daphnia, invasion, Japan, microsatellites, mtDNA. Bookmark the permalink.